About 500 years ago there was this spat. At the time, having your sins forgiven was a sort of pay as you go thing. It was a bit like a toll road. The toll booth worker was the Priest. If you bought “indulgences” the Priest could better settle up your debt with God. Handy little business model, especially when folks hope to avoid damnation, right? This became rather upsetting. So these Reformer types started protesting. It was not so much to split from the Church, but to transform it–at first. Of course, men can get pretty riled up about their new fantastic ideas (ever seen that? ), and before anyone realized it, a huge split…others might say a heresy or rebellion… was cemented into place in history–forever changing the landscape of Christianity. Spiritually speaking, some good was gained (and Catholics adjusted to these grievances by the 1960s with Vatican II), but as more and more people are beginning to realizing now, some very good and important things were lost because of going this route. So, what is the real purpose of a priest, or priest-like figure? Is it necessary? Can absolution of sin come from a man in a white collar? What about a teenager in a crew neck? Or a lady with a scarf? The I Timothy 2:5 “one mediator” verse is often used to underscore that Christ alone can forgive sins and be our mediator to God. It’s true. This was the mission of the Christ, Jesus of Nazareth. What is James saying…that confession and other believers’ prayers are powerful and effective against sin? Yes. This confessing to each other is not the same as be able to actually take Jesus’ place (obviously). James shows us that confession to each other works. It does something important. God wants it to be done this way. It absolves us (because God absolves us). So, it is true that we personally experience the relief of our guilt being removed. We experience, in real terms, the agency of God’s forgiveness of our guilt. Someone is there beside us, standing in the gap for us, so we can be reconciled more thoroughly, more completely than we can experience it otherwise. It is God’s work; and we are agents of his ministry. These confessors to whom we confess become a flesh and blood representation of God’s love that promotes gracious forgiveness and offers wholeness. It offers us freedom from guilt (felt guilt, and feeling or thinking as if Christ‘s work is not complete). It puts flesh on our spiritual justification. It seems we can’t handle our sin on our own too well, at all. We are sinful, and it’s not a private matter. Just confessing to God, and keeping our mistakes and sin to ourselves, is not the recommendation and requirement of Christ’s disciples. The Community of God (i.e. the Church; our brothers and sisters in the Lord) plays a vital role in our spiritual growth and growth in grace. 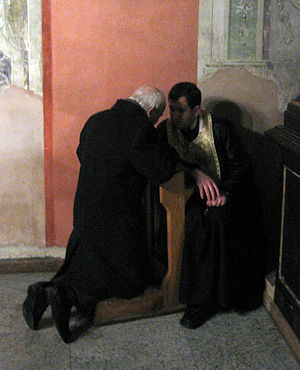 Confession ushers in that felt healing of the sin and guilt which weigh us down, and disables us. Our sin is a rejection of community (aka The Bride of Christ) and an act of selfishness. Our sin is a destructive thing. Socially and spiritually destructive. Confession and absolution, (the kind you might say/declare out loud to another person) restore us at a core level. To ourselves, to God, and to community (aka The Bride of Christ). In this way, we act not as God, but on God’s behalf. We minister. It is simply true that he forgives us. We concur and offer social restoration, and remind the confessing one of God’s gracious work and love for us. Please offer this to others. Ask for it on your behalf, too. Will you comment on this topic, please? Your input is vital on this one. Thank you. This entry was posted in Christ, Christianity, Christians, church, Community, forgiveness, God's will, Gratitude, grief, hope, Jesus, Life As Prayer, ministry, Practicing the presence of God, Prayer, Quotes, Recommendations, Scriptures, Spiritual growth, Spiritual practices, Spirituality, stress, suffering, temptation, Theology, Walking with God, worldviews, Worship and tagged absolution, atonement, Bible, Christ, Christianity, confession, confession booth, confessional, forgiveness, God, grace, healing, James, Jesus, Life As Prayer, love, ministry, Practicing the presence of God, Prayer, priest, Protestant Reformation, religion, Religion and Spirituality, sin, spiritual formation, Spiritual practices, Theology, Thoughts on God. Bookmark the permalink. well put. spot on. Thank you. As usual, your contributions make what I try to put down better than it was before. So grateful, friend. There was a lot of content in that post to think about and respond to. First, I think that the role of a human priest is foreign to the New Testament and probably antithetical to it. Second, to agree with much of the thrust of this post, I think that confession (to other people) is necessary, not optional. My guess is that most Christians will say that we only need to confess to God directly. God is of course the primary one offended by our sin and we do need to confess to God, but also confess our sins to one another. This, however, can be fostered but not forced. It should be expected though. Third, you lost me on the absolution. If you simply mean that we can remind others of God’s Word that they will be forgiven as they confess their sins, then yes. More, than that and I’m gonna need more convincing. The James passage you mention is important and we all probably ought to spend more time exegeting and applying it. This sounds like the Dan I know. I like the many colors of the fonts. Of that you are forgiven, with no confession needed. That’s to make it look sorter to read. (some do find it hard to bear though). So, also, don’t tell advanced typography professor. Keeping in mind, James does not say that confession to one another brings forgiveness. But, there is an element that the confession to one another brings about that confession to God does not – accountability….and I don’t mean the kind that one asks another “did you screw up today?”…but rather accountability that shares each others’ burdens. About forgiveness…we’ve lost something in the church today that the church in Jesus’ day had. They understood that forgiveness was something that only God the Father could do – and there was a great price to be paid for that forgiveness. Before Jesus, there was required blood shed to receive forgiveness…. In Mark 2:1-12 Jesus heals a paralyzed man. But what happened first was interesting (to me). The friends lower the man from the roof – and Jesus says “Son, your sins are forgiven”. The seminary professors and theologians of the day got indignant and said to each other “This is blasphemy! Only God can forgive sins!“. The people of the day were more quick to believe in healing of a paralyzed man than they could accept sins being forgiven. Today’s Church often has it the other way around…more surprised (dare I say suspicious) that God can heal than that He can forgive. I guess small groups can serve this function. I’ve even heard of “accountability groups,” but have never really seen one in action. Sounds like something we need, though.